Do you have a glider? Do you have a logger? Do you have the itch to fly beyond the gliderport? Then come on out and play with us. 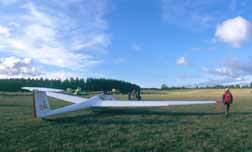 CCSC has an ongoing soaring challenge to members of the Caesar Creek Soaring Club. This isn’t a race, it is a continuing contest, and it emphasizes distance, not speed. To make things as simple as possible, the rules and format are minimized. You can fly whenever you want. You can fly any task you want to fly, as long as it is less than six turnpoints. And you can fly as many tasks as you want. Record your flight with a logger (preferred) or at least with a GPS that will produce a track log. Your distance flown will be handicapped according to your glider, and you will be given a score for that flight. Flight scores will be totaled to produce a yearly cumulative score. We’ll keep track of both best flight scores and highest total scores, and post them on a scoreboard. Your objective is to move up the ladder. This isn’t as rigorous as a normal glider race, it is flexible in terms of format and schedule. (How can you be more flexible than fly what you want, when you want to?) We aren’t going to have rules like “no communication except for safety purposes”, so it doesn’t exclude team work, assistance, or mentoring. You can fly for a badge, or to steal the trophy, or, heck, you can even organize a race with your friends, and still enter the flight in the contest. Just fly. We’re planning to keep track of two classes of pilots, Gold, for those pilots who have completed the Gold Distance requirements at the start of a contest period, and Silver, for those pilots who haven’t. The contest period starts on the second Tuesday in October and runs for one year. Smart guys are going to be wondering “Which unlucky pilot got stuck with scoring this mess”. It’s easy. We’re using the AeroKurier online contest. The online contest will score, record, and post ANY flight log that it receives from a registered member. Records are kept on a daily basis, by member, by club, by nation, or by region. ANY software that can produce a valid igc file will work. That means virtually EVERYONE flying a glider out of CCSC can participate. The onlinecontest.org site contains all of the rules for scoring, but they are simple. Check them out online. Now, come out and play with us!